Share Google Calendar within minutes - Here is how you do it! Home Internet How to Share Google Calendar? If you have created a schedule for one of your event or activity on Google, you can share Google calendar with one or more individuals who you feel are participants in that activity. Furthermore, you can also dictate permissions to these individuals permission to make changes to the calendar so that you have shared. In some circumstances, you can also let participants add or remove events to the calendar, so that, participants too can actively involve in your schedule plan and modify calendar as required. How to Share Google Calendar with someone? Primarily, there are two methods to sharing Google calendar with others, and I shall walk you through both these processes in this write-up. The first method is to share Google calendar with specific individuals only, while in the second one, you can make your whole Google calendar public and individuals with access to the link can view or modify events. As we go through, the entire sharing process, I shall bring in the two methods that we discussed briefly just now. Here we go! Step 1 – Open your web browser and navigate to www.calendar.google.com/calendar and login with your Google credentials. Step 2 – On the right-hand side of the screen, locate My Calendars. Hover over one of the calendars that you have created. For this example, I shall click on Birthdays. On the right side end of the label Birthdays, you will find 3 dots that represent Menu. Select Settings option from the menu expanded. Step 3 – On the right hand side of the newly navigated Settings page, click on your Name, this is located under Settings for my calendars section. This expands a series of Settings option. If you are planning to share your Birthday calendar with the entire public, including the search engines, follow the below steps, else if your interest is to share with only a selected few, skip the below section and head to the next one. On the right-hand side of your screen, Click on Access Permissions, this navigates you to Access Permissions section of the Settings page. From this section, you can share your calendar with anyone i.e. anyone with your public URL can access your calendar. Check the checkbox that says Make available to the public, and from the drop down menu, you can choose from the two options – See only free/busy (hide details)or See all event details based on how much of your calendar public can view. Once you are done with this, click on GET SHARABLE LINK to get the public link to your calendar. Share this link with anyone whom you want to view the calendar. If your interest is to share Google calendar with only some of your friends and family, do this. 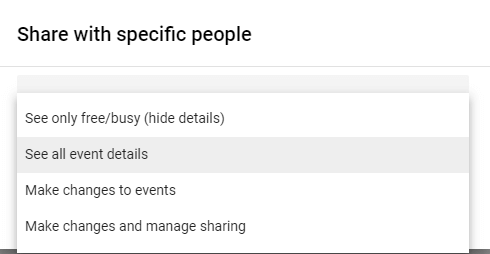 In the Settings section, under your name (on the right side of the screen), click on Share with specific people link – Upon clicking this, you are navigated to relevant section to add individuals to the calendar and to provide them with necessary permissions. Click on ADD People and type either email address or Names to find and add them. In the same screen provide permissions to the member whom you have added. Define permissions from the choices provided in the menu – See only free/busy (hide details), See all event details, Make changes to events, or Make changes and manage sharing. Click on the Send button to share your Google calendar with these individuals. That’s it! This is how you share Google Calendar with others. When others receive these calendars, events are automatically added to their Google calendar. 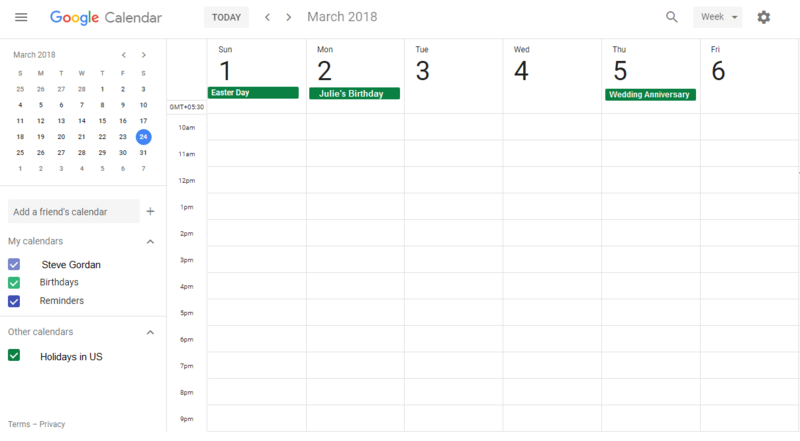 Google Calendar permits individuals to create many calendars to share different calendars with the different set of individuals for different purposes. If anybody tells you that Google has made them inefficient, do tell them how Google calendar can change their lives. Google Calendar has indeed made our lives much efficient and easier for one can schedule every activity of one’s life – from doctor appointments to exam preparation schedule to work hours, almost everything. The best part is Google calendar comes at no cost to you.